Psychologists noticed: those who like to knit cope with a stress and irritability more simply. Why so happens? In recent years knitting stopped being destiny of grandmothers – the active, working hard businesswomen are fond of it more and more. And psychologists do not see in it anything surprising. According to them, one of the most available and effective ways of disposal of psychological tension is knitting. The uniform, rhythmical motion of hands, slowly unwound ball, loops attached one to another with exclusive accuracy, sometimes – silent jingling of needles … In physiology of work there is a concept of “Monotony Period”. It describes a condition of the person who is engaged in monotonous simple mechanical work, say, costs at the conveyor. In the course of such work the tone of nervous system, and at times and muscles decreases. Heartbeat is quite often slowed down, arterial blood pressure decreases. As a rule, speak about the monotonous Period with a negative shade – she gives rise to boredom at the person and reduces labor productivity. However, if it is not about the work performed for eight hours a day, and about a hobby like knitting, in monotonous actions there can be pluses. The state the monotonous Period allows to relax and calm down – even at the physiological level. That is why modern psychologists often compare knitting to yoga and meditation: work as needles brings a pacification and gives feeling of internal harmony. Not casually in some foreign clinics to patients before painful procedures recommend to knit – it reduces uneasiness and quite often raises a pain threshold. As means of an emotional discharge knitting perfectly suits those who at work constantly should solve these or those problems, to agree with clients, to communicate much with people. Search of loops allows not only to calm nerves, but also to return to femininity which in the last decades is actively denied. Installation on success in career, fierce competition, the equal rights with men granted a lot of things to women. However, the tendency to creation of a coziness, preservation of a home created in millennia is very deeply implanted in female psychology. And, to feel well, to it is necessary to come back from time to time. Knitting gives such chance. And still it allows to be released for a while from that powerful flow of information which is suffered by each resident. It is a fine opportunity to forget about daily troubles, to classify everything. Not so long-ago scientists made an experiment: volunteers were seated – someone with needles and a ball, someone without – in front of the screen on which showed the movies abounding with violence scenes. The brain of those who knitted practically did not apprehend information from terrible shots. People were so involved in needlework process that negative emotions avoided them. Ability of knitting “to tighten” the person and by that to distract from problems, led to the fact that psychologists often appoint it at depressions. There is also one more important factor, knitting – one of the few occupations which is capable to bring the real satisfaction. Long ago it is noticed: that the person was really pleased by occupation, he has to see its result. Unfortunately, in the last decades there were many professions which do not give such effect. The office manager can answer the whole day calls, solving the most different problems, and the sales manager is capable to bring to the company huge income. But in fact, they make nothing, do not see the end result. Because of it there can be a feeling that work is senseless, and even salary at the end of the month will not please. Housewives often face a similar problem also. The washed-up floors or the ware polished to gloss please absolutely not for long, everything comes back to a former state soon. Knitting – at all its monotony – creative process. 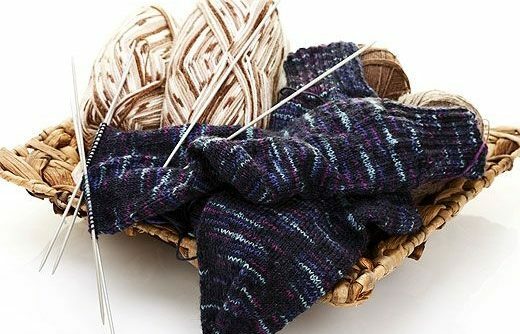 To knit a pattern on a sample or to somehow change it, to take red or green wool, to knit a sweater or a sock – all this in the power of the one who undertook needles. The person himself defines what will be his product, and can see, put on, show it at the end to friends. It is what he created itself what he enclosed a part of in – the satisfaction is guaranteed here.